It is very important to ensure your vehicle is fitted with tyres that comply with motoring laws and are fit for purpose. Driving with damaged or worn tyres holds the driver at a big risk of fines and even endorsement points been added to their licence. In most circumstances; Insurance policies can also be invalidated meaning an accident caused by a vehicle using damaged tyres will most likely not be covered by insurance. Our tyre guide below should hopefully better inform you of the legal requirements in relation to tyres fitted to vehicles. If the information you're looking for is not available then please feel free to contact one of our experienced staff members. The current legal limit is 1.6mm of tread over the central 3/4 of the tyre in a continuous band around the entire circumference of the the tyre. 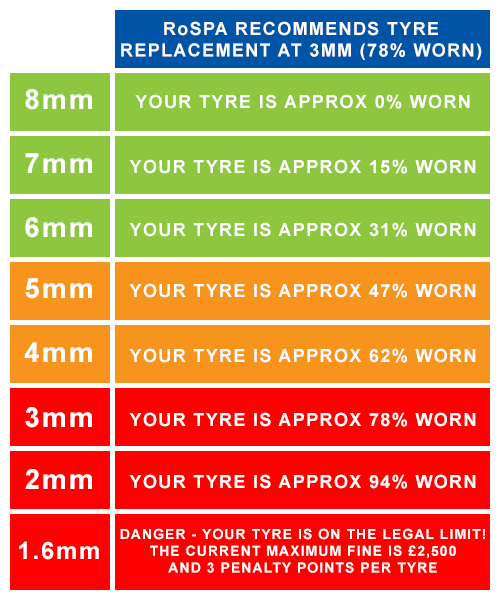 the RoSPA recommends changing tyres when they reach 3mm. below is a handy reference chart regarding tyre tread depth. The lower you allow your tyre tread to diminish the further your stopping distance becomes, especially in wet conditions as shown in the image below. 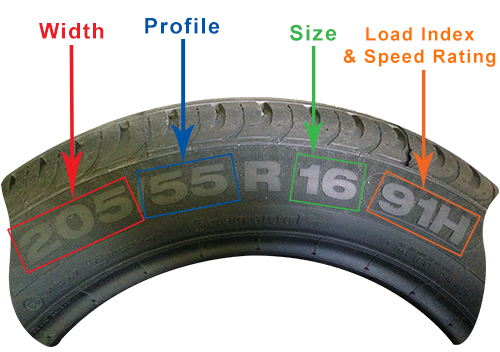 All bike, car and commercial vehicles come with a helpful code provided on the outside of each tyre, the code most commonly comes in 3 parts consisting of the width, profile, size. It may also have a speed rating and load index. This is the information we will need when you contact us for a price. An example of the tyre code is shown below. Image showing position of tyre width, profile & size. When ringing us for a quote, please have at least the width, profile and size available.